The following article by Peter Duker and accompanying photos are taken from the May 1977 issue of International Cycle Sport and are reprinted without permission. The magazine itself folded many years ago. If anyone knows the copyright holder and they have an objection I will, of course, remove this page. THE faces of the crowds that lined the Via Roma at 4 o'clock on Saturday the 19th of March could have provided a cartoonists dream. In the drawing, despairing eyes would have stared from disbeleiving faces, as chins sagged and were supported either by the pavements or the barriers. Out of the enormous Italian entry in their own Special International Classic, not one of them figured in the final positive results. Nor even could the tifosi have the consolation of seeing an Italian jersey sail over the line, its short sleeves raised in victory, abeit inside might beat a Belgian heart. "Jan Raas ?"... "Who is he?" The Italian fans were entitled to ask. The specialist sports papers, and indeed the sports pages of the general Italian newspapers, do not concern themselves a great deal with what goes on "over the border". The results of the Tour of the Mediterranean and Paris- Nice being well tucked away in obscure corners of the publications, especially as the Tirreno-Adriatico, the Race of the Two Seas, is run concurrently with The Race to the Sun. Much less of their space would have been devoted to the Championship of Holland last year, and the final placings of the recent Het Volk would not have inspired a great deal of interest. After all, Feddy Maertens had won, and who the hell cared who was second ? It wasn't an Italian anyway. Jan Raas had put in quite a useful early season. Two wins in the Mediterranean, (sorry, Mr. Kelly, but that's what the book says! ), 3rd in the prologue of Paris-Nice, 3rd again in the sprint to Auxerre, and a fifth on the Promenade des Anglais which brought him 9th place overall. It may have been a stroke of fortune that he did not succeed in winning the Het Volk, although he tried hard enough, as if he had done so them might have been a few beady Belgian eyes on the slight, bespectacled Dutchman. Jan Raas elected to leave the Raleigh team at the end of the season, to seek employment from a firm that was willing to give him more freedom and scope. Frisol gave him the opportunity to spread his young wings. And speaking of Frisol. may I be permitted to say congratulations on a well-oiled exercise...see who was third! Raas rode Milan-San Remo last year, and for all he knew he could have been last man over the Poggio. All he wanted to know was exactly what it consisted of. Why was it so magic? Where was the key? At every opportunity he watched playbacks and finishes of former editions of this great race. It was always the Poggio that held the secret of final victory. 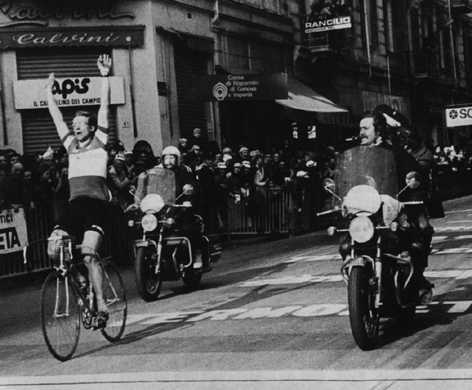 Merckx had used it time and time again to amass his incredible tally of seven victories here. But let's start in Milan. The evening before the event. The Frisol team were lodged in an unpretentious hotel within the city limits. Florent van Vaerenberghe, their team manager, crossed over to Raas and sat down beside him. "What do you think ?" he asked simply. "Will the team work for me?" came the question in reply. "You think that you have a chance ?" Van Vaerenberghe went off and spoke with the other members, and then returned. "Yes, they will work for you," he said. "Ocana even more than the others. He realises that he stands no chance here. He also said that he may have need of your help later on." And so it was prepared. I think that it is fair to say that Milan- San Remo is more of a lottery than any of the Classics on account of its topography. First the Turchino Pass and then the three Capi, and that really is all as far as difficulties go, and it makes for the road- man-sprinter. But it is a very fast race and carries as much prestige as its counterpart between Paris and Roubaix. Those who disagree with me will plump for Paris-Roubaix, and I hold no objection, but to pick a winning number from 230 is a hard task, and be honest with yourselves, how many of you could have rushed to the bookies window with a winning ticket this year?!! 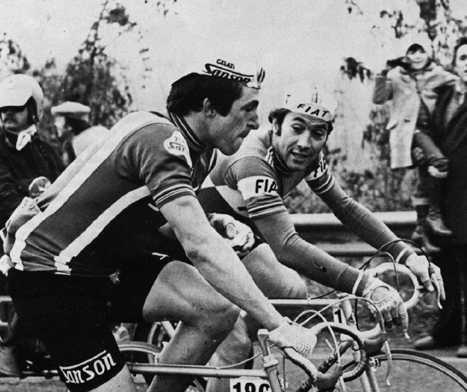 Francesco Moser and Eddy Merckx were too busy chatting to get involved in the action at the 1977 Milan - San Remo. British readers will remember the heroic but suicidal break made by Phil Bayton and Dave Lloyd a couple of years ago. The race lends itself admirably to isolated acts of aggression, and so, this year, Ueli Sutter of Switzerland, riding for the Italian firm of Zonca-Santini, took off with Piero Algeri, a G.B.C. employee, and just like the Bayton-Lloyd Duet, were let off the general leash, their lead extending to 8 minutes at one particular point. What was different this time was that when they were caught, after being clear for 165 kilometres, by Kuiper, Godefroot, Paolini, Rossignoli, Magnini, and the diminutive Australian, Clively, they stayed in their company until they were all finally reeled in. This meant that the pair of them had been away for 200 kilometres. And what is more important, they finished. It is not possible this year to say "great battles raged over the Capi" or other fancy terms, as it was quite the opposite. However, I do not mean that the huge bunch just rolled along doing nothing, but the interminable internal Belgian squabbles reduced the effective- ness of their physical superiority, just as the Italians made the mistake of waiting for a Big Belgian to make a decisive move. These two nations played directly into the hands of anyone else who wanted a bit of the action, and there were plenty about. The Swiss were quite numerous and made their presence felt all day, but it was the Dutch who finally scored. The French up to now have had no mention, and perhaps it is kinder that way. They finished but 3 men in the first 80. Sibille, Beon, and Mollet in 1 3th, 43rd, and 63rd positions respectively. Although it must be pointed out that Andre Mollet rides for a Belgian team. All did not go well for Jan Raas to begin with. On the Turchino he fell, and Wilfried Waesemael gave him his wheel. It took 32 kilometres of hard chasing to get back on. The ungainly peloton of over 200 men was not exactly hanging about on the Iong crossing of the Po Valley. The two escapees were still out in front doing a blinder. The counter-attack had gone off. And now we have crossed the first of the notorious Capi. On the second, four men went clear. Frisol's Cees Priem (incidentally Raas' brother-in-law), Osler, Perletto, and Roland Salm. At the base of the Poggio they had a lead of 20 seconds. Then the ultra-young Italian, Guiseppe Saronni a mere 19 years old, attacked furiously along with Jan Raas. The two men caught the break, and then Priem had the misfortune to puncture. With his team-car trapped behind the bunch there was nothing to do but give up. Taking advantage of the situation, Raas attacked again immediately, and Guiseppe Perletto was the only man to be able to make any sort of answer. He was not strong enough to completely counter the Dutchman, and Raas had a 20 metre advantage over him as he topped the summit. It was here that the lessons he had learned from the Master, Eddy Merckx, took effect, and he started his insane plunge down the other side towards the packed streets of San Remo. The thoughts flashed through his mind. "At the bottom of the Poggio it's not yet all over. There's a lot of tarmac left. I might be able to use Perletto's company. But I don't know him. I don't know whether he can sprint!" There was no waiting to be done, and the frightful flogging that this boy gave to his tired body through the streets to the finish line on the Via Roma, taxed his strength to the very utmost. The bunch was at his heels, and in between, the greatest Belgian-ltalian of them all was hurtling along right behind him. But he made it. The crowd was astonished. "Who wears the tricolour jersey ? "The Champion of France ?" "Raas. Jan Raas. Champion of Holland"
The Winner of the 70th Milan-San Remo THAT'S WHO! 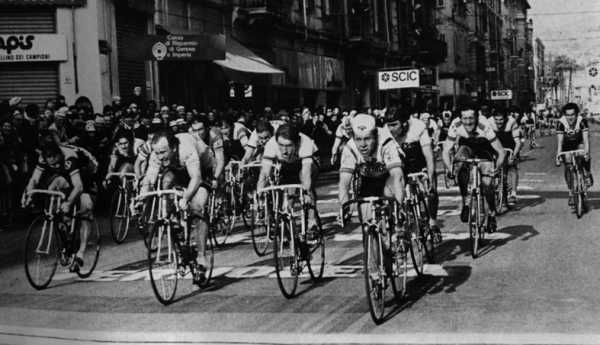 The sprint for third place in the 1977 Milan - San Remo. 2 R. De Vlaeminck (Brooklyn) at 3"
3 Wesemael (Frisol-Gazelle-Thirion) at 5"
4 Van Linden (Bianchi) s.t.